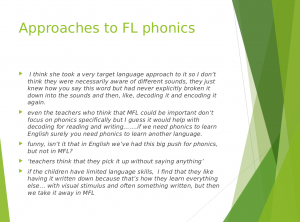 Primary foreign language learning and teaching - how can we improve our MFL provision for all learners? Essentially, this means providing all teachers - those already teaching, and new trainees - with the tools (language and cultural knowledge and pedagogical practice) to enable them to teach a modern foreign language confidently, enjoyably, and effectively. Teachers are enthusiastically teaching MFL - what help would they like and what help might they need? Empowering classroom teachers to teach MFL is a two-way process. Established teachers already have good pedagogic skills and a wealth of teaching practice and expertise to draw on, which means that individually-tailored MFL-teaching programmes specific to teachers' particular needs are helpful. knowledge of age-appropriate programmes available, and how to create additional materials. As a practising teacher, I don't have much time for extra training, and the school budget is tight - what can I do? > CPD intensive training days impart a lot of information and workshop practice, but they can be expensive for a school. > Peer-to-peer support from within a school is an excellent way of enlisting whole-school support; so too, is peer coaching across the cluster. > Networks online and on the ground can be great providers of support, and encourage an exchange of knowledge. > Classroom-based research allows a classroom teacher to try out new things whilst receiving expert feedback. Our Bibliography section has a list of practical books for practising teachers, and do check our Presentations section for a powerpoint on teaching literacy to young learners.